She practices near one of the largest Amish communities in the US in a state where lay midwives operate in a “gray area” legally. She likes it that way because the Amish women don’t question her, trust her implicitly, and will not pursue litigation or repercussions of any kind. They call her for any kind of medical questions they have, even outside of women’s health, and she freely dispenses medical advice over the phone without seeing the patient in question. Sometimes her advice even contradicts a doctor’s advice. . .guess whose opinion carries the most weight? If you think that Utah midwives are operating any differently…you are in for a surprise. I have already covered some midwives practicing medicine in my posts titled “seriously?” and “seriously? part 2“, but above is a post from the vickie sorensen support page talking about the same behavior from a midwife who was recently charged with manslaughter in connection with a baby’s death. They are using the words of people who openly discuss vickie sorensen acting outside her scope of practice, and they think that proves that she is a wonderful person instead of an irresponsible person. This seems to absolutely be the norm for midwives, although when they lobby for legislation to keep unlicensed midwifery legal, they claim that midwifery is different from medicine. They have to claim that. If they told the truth then it would logically follow that they need to obtain a license and insurance to practice. Peer review is a process that exists in many disciplines, usually ones with high stakes decision making like medicine or science. The purpose of peer review is to verify the truth, and sometimes to recommend a disciplinary action (if the peer review arose out of an incident that ended poorly). Peer review can be very scary for those who are going through it, since the idea is to be critical of a person’s actions or ideas. No matter how scary peer review is for the person being reviewed, it is absolutely essential to everyone else that it be done. Drugs cannot be put on the market because the researcher’s feelings might be hurt if someone points out a flaw in their study of its safety. Doctors cannot be allowed to keep practicing in a negligent manner because the peer review board thinks doctors should stick together. Everyone recognizes that patients and the public in general are the reason for peer review. …everyone except direct entry midwives of course. I found the utah midwive’s association’s peer review protocols, and they are an absolute joke. You aren’t allowed to question why a midwife performed a certain action. You will be asked to leave if you ask why someone chose the course of action that they did- this means even if someone died or was disabled because of the action, other midwives aren’t allowed to be critical of it. You are only allowed to ask if they considered a different course of action. You aren’t allowed to hurt another midwife’s feelings, that seems to be the main concern throughout the document. They do peer review for “educational” reasons, although I don’t know how much education can be gleaned from a discussion where critical thought (which generally involves asking hard questions) is not allowed. Please do not present cases in which there has been or may have been illegal conduct, such as an unlicensed midwife administering medications or a licensed midwife acting outside her scope (delivering twins, for example). We want the review to be a safe place where we can learn from each other. Announcing that you have engaged in illegal or questionably legal activities as a midwife puts you and each participant in an emotionally, ethically and legally perilous situation. Just don’t do it! How are the midwives who are doing illegal things supposed to learn about the dangers of it if they aren’t allowed to discuss it in peer review? 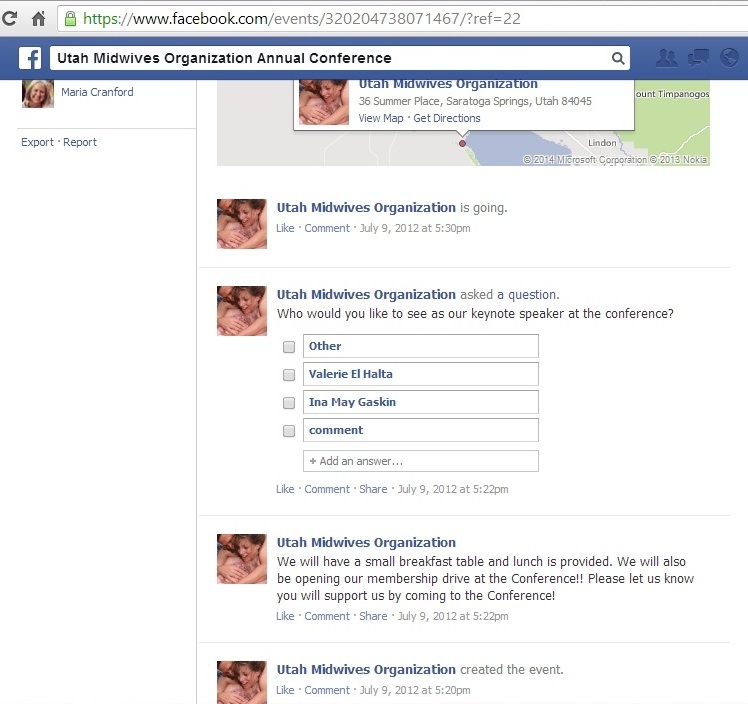 The utah midwive’s organizaton has lobbied to make it so that unlicensed midwives can take on any client they feel comfortable with, regardless of the risk level involved, and now they refuse to even let these women learn the error of their ways through a peer review instead of by personally maiming or killing someone. Its deplorable. It is worth noting that the majority of midwives in utah do not decide to become licensed, likely so they can practice outside the state’s guidelines. The Midwive’s College of Utah and Community School of Midwifery both teach skills for homebirths that fall outside the license midwife’s standard of practice (such as twins and breech births at home). These practices are encouraged in the name of “trusting birth”, and bragging rights of course. I’m sure its wonderful to be the breech expert in town like Melody Pendleton claims to be. You can contrast their joke of a peer review process with an actual hospital peer review protocol. Procedures Manual and Corrective Action and Fair Hearing Plan. Peer review is supposed to be about improving the care provided. Advising participants to lie about their activities or to avoid hurting anyone’s feelings is just another piece of evidence that direct entry midwives aren’t professionals, they just pretend to be to deceive more Utah families into hiring them. If your baby dies or is injured in a home birth, if your midwife fails to show up or lies to you about the safety of your pregnancy, if your midwife does ANYTHING she isn’t supposed to, these are the people you are supposed to be able to turn to. But they will do nothing to help you, they turn their backs on anyone who does not aid them in the goal of hiding the deaths and injuries caused by home birth midwives in our state. Jessica Weed- the next Valerie El Halta? Jessica Weed, a midwife in Albuquerque, New Mexico, helped in the breech delivery, when a baby is positioned to be born feet first, on August 28 but the newborn suffered bleeding on the brain and in the retinas after the complicated birth. Additionally, the mother’s placenta was not delivered and the woman, Kristin Himm, developed an infection when it became toxic. two days after the birth, Himm took the newborn to the hospital on August 30 and Weed allegedly told the mother not to disclose that the midwife had delivered the baby because Weed said she was having problems with her Midwifery license, according to the Albuquerque Journal. Imagine my surprise when I saw that Jessica Weed is still in business as a ‘birth guru’ despite demonstrably poor judgment and training. One of the cities she has hosted trainings in the past is Provo, Utah. What would prevent Jessica Weed from delivering babies here? Absolutely nothing. She has a CPM credential, which is more than enough to secure clients. Other midwives support her just like they do every other dangerous midwife, because sisterhood matters more than safety to non-nurse midwives. The credential is more than Valerie El Halta had when she secured clients in Utah after a history of trouble in other states. You might be thinking that guilt is an adequate deterrent. Perhaps Jessica feels bad about what she did and does not intend to deliver babies anymore, right? Remember that this is a woman who got in serious legal trouble for failing to intervene when a reasonable person would. She still waxes poetic about the beauty of not doing ANYTHING during a birth. Maybe you are thinking- she probably just learned from past mistakes and incorporated the experience into her practice. Wrong again! She does nothing but whine about how it was unfair and how she did nothing wrong. These are not the words of someone who has learned from their mistake- she would have to admit a mistake was made to learn from it. There are two issues with Jessica Weed deciding that unassisted childbirth is a poor choice. The first problem is that her case is proof that not having a midwife is often superior to having a non-nurse midwife. If you look at her case you will see that the client had concerns and Jessica told them it was fine. Over and over she said it was fine, and when it became clear that it wasn’t fine, she advised the parents to lie to the hospital about her role in the birth (which by definition prevents her from participating in the exchange of important patient information with the hospital). Both of these things put the patient in more danger than if they had birthed at home alone. A concerned parent without expertise will go to the hospital when concerns arise or call 911. The mother likely could have been spared a serious infection and the child could have been monitored and treated for their internal bleeding. A care provider who insists on lying to cover her own legal bases instead of giving priority to protecting patients runs the risk of giving inaccurate information to physicians (or failing to give important information at all). Jessica Weed pretends that midwives never make things worse, when she should know first hand that they can. The second problem is that Jessica Weed promotes Unassisted Childbirth (which she calls ‘freebirth’). This means she is either lying about the safety of freebirth or she is lying about the utility of a lay midwife during home births. The common theme here is that she says whatever will earn her more money at the time. Jessica Weed has Unassisted Childbirth (‘freebirth’) coaching for 1000$ a pop. She is willing to charge 1000$ for emails and phone availability, despite her history of saying “everything is fine!” when medical attention was needed. I am alarmed by the lack of restrictions on midwives and their practices. A physician or a nurse that has their license suspended for negligence cannot simply pack up and start practicing somewhere else without some major hurdles in the way. There are literally no hurdles for midwives who kill or maim- they get to keep going, all with the support of other midwives who are too invested in keeping unlicensed midwifery legal to care about what it costs babies and families. Utah midwives, including political candidates like Tara Tulley and Holly Richardson, have no problem with the system as it stands. They would likely welcome Jessica Weed or Christy Collins to Utah with open arms and kind words, if their welcome of Valerie El Halta is any indication. And ps: I have not hosted a “midwifery meeting” in almost 10 years. Your “facts” are, in fact, wrong. While I’m flattered you want to highlight my campaign, your anti-midwife agenda will get you nowhere in this state. I am not anti-midwife, I am anti-unaccountable medical practitioners. I am sure that the majority of people in utah are. And really, you have no idea what you are talking about when it comes to Utah law, the process we went through, or the mood on the Hill. Holly does not cite the portion of the law that would prove me wrong or tell me exactly where I made an error, I am very interested in knowing where I made a mistake. I will correct it if it is demonstrated to me. Sadly, you’re not even brave enough to use your real name to attack political candidates. I don’t use my real name because I blog about my abuse history, and it is humiliating to me to have anyone googling my name find out that it happened to me. Newspapers use this same standard in their reporting, and it is reasonable. I am proud of my work on behalf of midwives in this state. We have a long history of safe midwifery care. I linked to several stories of extremely dangerous breech, vbac, and twin births being presided over by utah midwives. Holly is already aware of how unsafe Valerie El Halta’s practices were, because they killed someone who did not have to die. Dr Amy Tueter has a saying about home birth babies that die- they are buried twice. Once in the ground, and again by midwives and their advocates who don’t want the public to know about them. This is a prime example of being buried twice, pretending that there is a long history of ‘safe midwifery care’ when there was at least one high profile case of extreme negligence in the past two years. I am joining the skeptical OB in using the #notburiedtwice hashtag on twitter to make sure that these babies did not die in vain. For those who practice outside their scope, there already are safeguards in place. Oh really? Where were those safegaurds when I was pregnant, and my midwife lied to me about her qualifications and practices? Because I’ve tried, unsuccessfully, for over a year to get something done about the midwife I had that acted outside of her scope and abused me during my labor. If there is some resource I am missing I am very interested in hearing about it, but so far I’ve tried the owner of the birth center where the midwife worked (who blamed me for what happened), DOPL (can’t do anything about unlicensed people), the police (do not know what to charge someone with who pretends to be licensed but isn’t, do not have enough evidence to go to the DA with my other claims), Utah Midwives Organization (who I had to pester to get a response and ultimately rallied behind the midwife that abused me), and the Midwives College of Utah (who are putting a note in that birth center’s file for later- no idea what that actually accomplishes). Nothing was done. Valerie El Halta made the ultimate mistake, one that killed someone, and she got probation and a ban from attending other births in the state. She will probably just move again to another state where midwives can get away with being unlicensed. We are a right-to-work state and we are predominately Republican, which means we believe in limited government and in people’s right to make decisions for themselves and their families – and those include healthcare decisions. I am pretty sure that republicans also believe that little babies should not be killed because of their parents choices, right? Or are republicans pro-choice now? Because what I see is a lot of babies being sacrificed to letting parents decide to birth out of hospital, and in fact the states with the most restrictions on home birth are predominantly republican. Although you refuse to use your real name, I am quite certain that you were never a part of the discussions to legalize midwifery in Utah, nor have you ever been involved in lobbying. It’s evident that it is difficult for you to read and understand the Utah code but I assure you, there are consequences for those midwives who practice outside their scope. 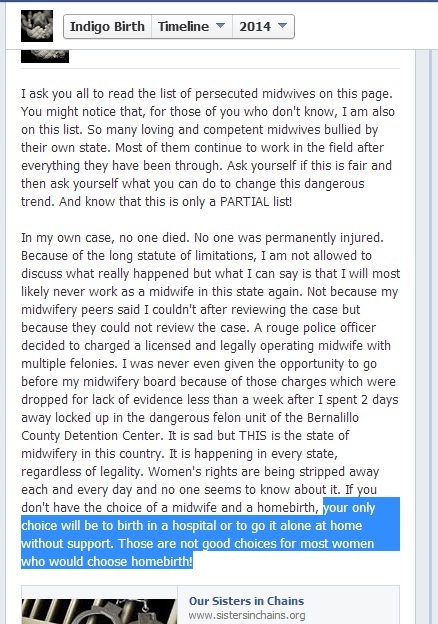 Once again, the consequences are not named and law isn’t cited, and I have first hand experience in trying to get something done about this and there isn’t any real consequence for midwives. There just isn’t. I am eager to learn of any new avenue for getting my situation resolved. Believe it or not, midwifery is not my primary interest in running for office. It’s education and the economy. 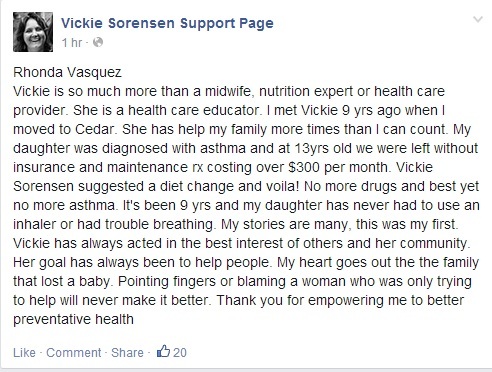 It should be your primary interest because the state of midwifery in Utah is appalling and you had a hand in it. Take some responsibility and pledge to fix the law. 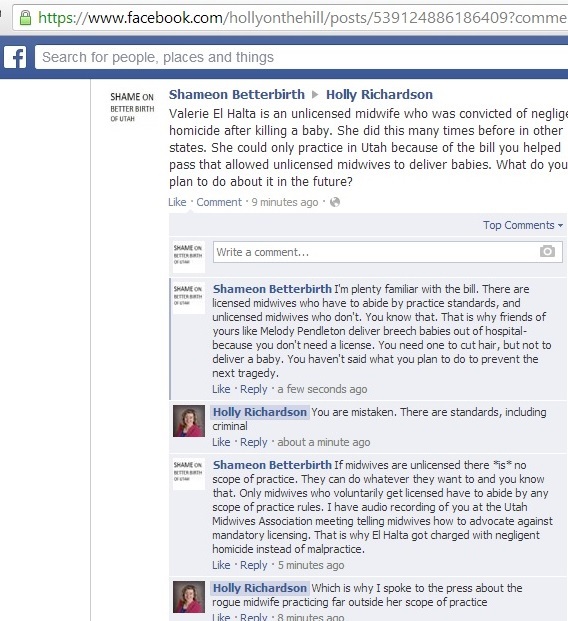 I’m not going to stop my exposure of the deplorable practices of utah midwives in response to negligence. You all are just one more tragedy away from this whole thing blowing up again. I can wait, but I wish I didn’t have to, I wish that someone with the power to change things before they get out of hand would do so. I said “What do you plan to do about negligent midwives? 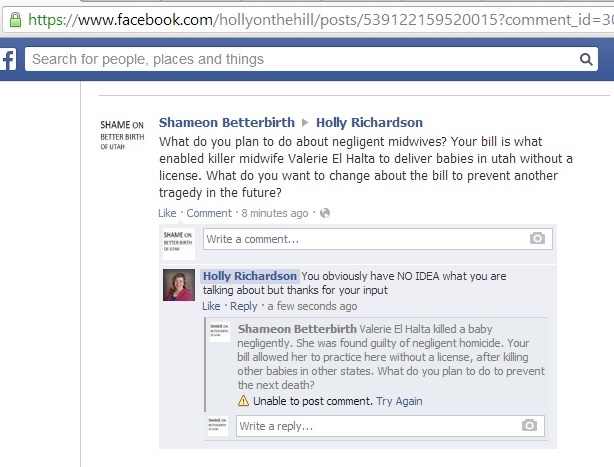 Your bill is what enabled killer midwife Valerie El Halta to deliver babies in utah without a license. What do you want to change about the bill to prevent another tragedy in the future? I tried to reply but she had deleted the thread already. I am not sure what she meant here, I did know what I was talking about. El Halta had her NARM certification revoked before coming to Utah, she came here because she could practice midwifery without having to obtain a license. If there had been mandatory licensing in our state she would not have come here, and would not have worked as a midwife, and would not have been given permission by the state to kill another newborn. A life might have been saved by that legislation and we now have an opportunity to maybe save someone else in the future, but Holly isn’t interested. She isn’t interested in being responsible for the legislation she pushed through in Utah and its deadly results. I would be more willing to be charitable towards Holly Richardson if she took some responsibility for what happened, but she doesn’t. I went back to her facebook page to talk to her more because I think the public deserves answers. I ask again about what she plans to do about the bill that enabled the death of this child. She replies “Which is why I spoke to the press about the rogue midwife practicing far ouside her scope of practice”. I point out that unlicensed midwives aren’t subject to the scope of practice standards in the direct entry midwifery act. Holly claims there are standards, “including criminal”, but I could only find two actual standards for unlicensed midwives. They can’t claim to be licensed, and they can’t carry certain drugs. The law says that doing those things is “a misdomenor”, but when I reported the midwife I used (who claimed to be licensed but was not) nothing happened. Valerie El Halta was not charged for using prescription drugs w/her patient either, so the law is not being enforced nor is it clear what misdomenor police are supposed to charge unlicensed midwives with when they violate these (weak) standards. Unlicensed midwives can attend any kind of birth they want to, and that is the important issue that is cause for concern in utah. They can attend a footling breech birth after 4 c-sections with triplets if they want to. Nothing in law prohibits dangerous practices from midwives who aren’t licensed. Holly knows that, because her personal reaction to the newborn death was to host a meeting instructing midwives on how to lobby to keep the laws exactly the same. A baby died and her reaction was to help everyone keep things the same so that this can happen again. I want to take a moment to address Holly Richardson’s claim that Valerie is a “rogue” midwife, because I know that isn’t true either. 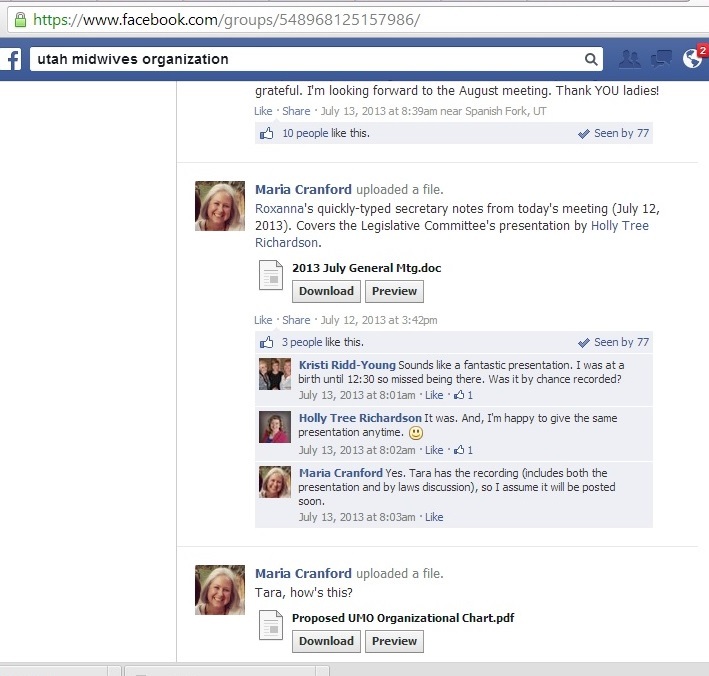 Holly is an administrator of the Utah Midwives Organization. When they were getting together for an annual conference a few years back they had a poll asking who should be the keynote speaker. Check out the names suggested here: Looks like you can choose Ina May Gaskin, Valerie El Halta, or “other”. Valerie came to utah after a long history of dangerous practices and dead children, so it wasn’t some sort of secret that she behaved this way. If she was a rogue then she was one that the community completely supported and accepted (meaning, she wasn’t a rogue at all). Only when the press came asking questions did anyone pretend like this death was surprising. Holly also pretended that it was unusual for midwives to practice far outside of the scope outlined in the direct entry midwifery act, but its not. I know for a fact it is not. Do you have a baby that is in breech position after 36 weeks gestation (which licensed midwives aren’t supposed to attend)? Don’t worry, there are unlicensed midwives willing to help you out, and your licensed midwife will pick up the phone and call her if things get dangerous and give you tips on how to avoid going to the hospital. Here is a ‘breech expert’ even (whatever that means), who delivered an almost dead baby in 2011 because midwives helped the mom avoid transfer. It was a VBAC too. That is a combination of risk factors that no midwife should find acceptable, but more than one of them did. There are other breech stories floating around, and that the Midwife Alliance of North America (MANA) has demonstrated that breech births have horrendously bad outcomes when attended by CPMS in out of hospital settings. There is no excuse for why this continues in our state, knowing what we do now. UPDATE 2/24- the story I linked to above has been removed. Luckily its been screen capped and can be found here. Oh no, but what if you have twins or gestational diabetes? What if you have those problems and a prior c-section? Don’t worry about that either, here is a woman who will take you on as a patient even though she isn’t qualified to manage those conditions. Here is a story about an overdue set of twins being attended to in utah by a midwife (who was likely unlicensed). 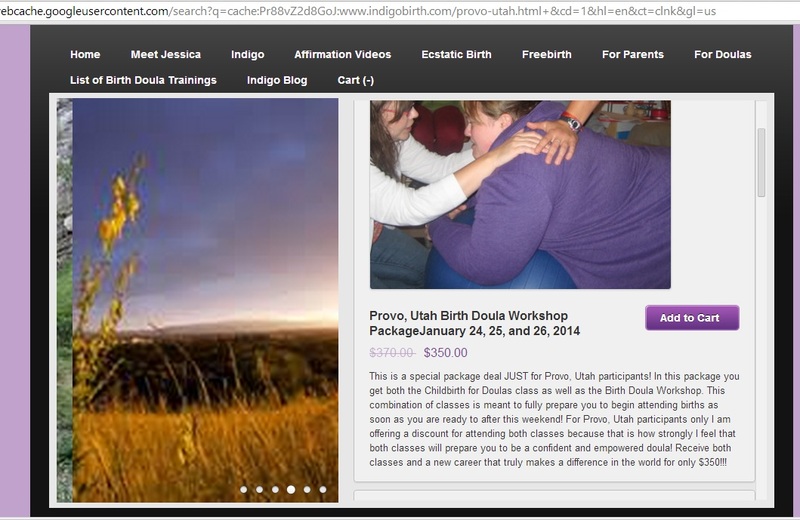 Here is another unlicensed Utah midwife advertising her willingness to attend vbacs, twins, and breech births. Do you think that the public will stand for deaths to happen again and again? How long do you really think this will last? Wouldn’t it be better to prevent a death instead of trying to cover up the practices that led to it? I am officially a midwife! I believe birth is a wonderful, natural experience and that women’s bodies know how to birth. I’ve attended 800 hundred births over the past 15 years, and have received advanced birth attendant training. I was a doula before I became a midwife. I am the founder of the North American Midwives Educational Association’s College of Midwifery (NAMEACM), which has certified me as a Level 12 Midwife. I have had quite a journey that led me to my ‘calling’, the most major impact was birthing my 17 children at home. I am humbled to be able to attend your birth and help you through your own personal journey of feminine empowerment. I will encourage you and will believe in your own power to birth naturally in a setting of your choosing (at home, at a birth center, while water skiing, at fashion place mall, etc). I am an expert in breech presentation, twins, VBAC, and other variations of normal. I also encapsulate placentas and make memorials out of umbilical cords, in addition to any other arts and crafts you request be made out the awesome raw materials that birth grants me. I can show you all my great testimonials (once I have written them, of course). My prices are 3,500$ for basic a basic birth package, but believe me- it’s worth it. Oh sorry, none of that makes a midwife, because none of it is actually true (except for having attended birth attendant training_. What makes me a midwife, legally a midwife in the state of Utah, is that I’ve simply declared that I am one. I can attend the births of babies without any training and while passing off false information to my ‘clients’. I can do dangerous births for large fees (non-refundable, of course) and then wash my hands of the consequences if I kill someone. After all, I can trust other Utah midwives to rally behind me, right? There is nothing to stop me from claiming I have experience that I don’t because there isn’t a way to check up on unlicensed midwives. There is nothing to stop me from simply inventing my own midwifery school website and testimonials to fool people into letting me deliver their babies. I can pretend that I have experience in births that I have never attended. There is nothing to prevent me from pretending that I had 17 home births when I’ve only had one baby via c-section. After all, why would clients need to meet my kids? All there is to it is to pretend that you know what you are doing and that everything will work out okay, oh and to call yourself a ‘midwife’ and say all the right buzzwords. If I were a dishonest person with good networking skills I could be attending births in no time, I would just need to find someone vulnerable enough to fall for my scam. If you think that you need real qualifications to attract clients, think again. Check out this midwife’s ‘about me’ page, it has absolutely no qualifications listed except her own kids births and having been at it a long time. Oh, and testimonials. This should frighten Utahans, parents or not, because its ridiculous and obviously very dangerous. If I wanted to cut someone’s hair for money I would need much more training than I would to deliver breech VBAC babies.